Which brings us to lettuce – forever dependable, always forgotten and scraped to the side of a plate. I wrote a multi-paragraph post about it but it seems to have not auto-saved like it used to do before. RIP lettuce love letter. To summarize: I love lettuce. It’s not trendy. It actually is nutritious (but this should be low on your consideration list when eating it, unless advised otherwise). And you can make soup out of it! Whaaaat. I’ve been eating a lot of lettuce ever since I fell in love with the Caesar’s salad dressing and consequently, an easier version of it. I didn’t grow up with lettuce. The few vegetable-y things we ate raw were onions, tomatoes and cucumbers. So in my mind, lettuce has always been a special green and not a discard like some restaurants in America treat it. 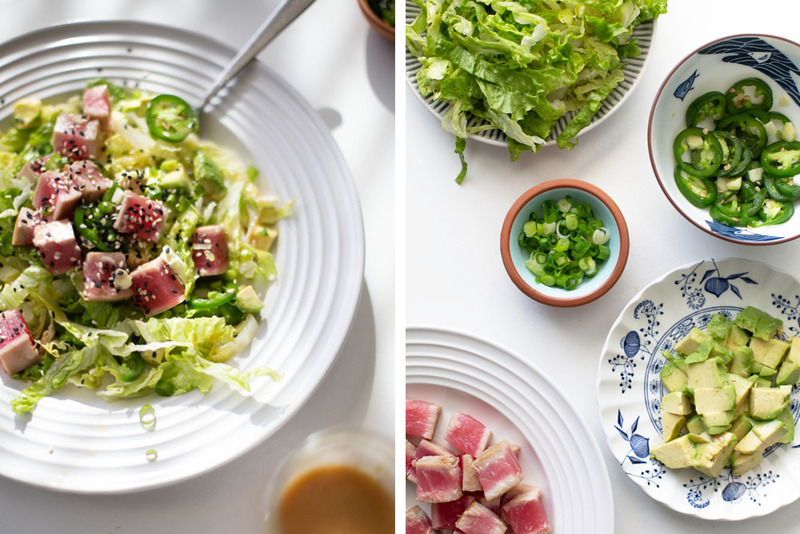 This recipe uses green leaf lettuce, but you can us whichever kind you like. The only “rule” is to make sure you use a crunchy head of it. You can relegate the limp leaves to the soup pot or like I do, mulch. In a small jar, whisk the miso paste into the rice vinegar until no small bits of miso remain. Pour the sesame oil and into the miso-vinegar mixture and cover the jar with a lid. Shake it until smooth. Add salt to taste. 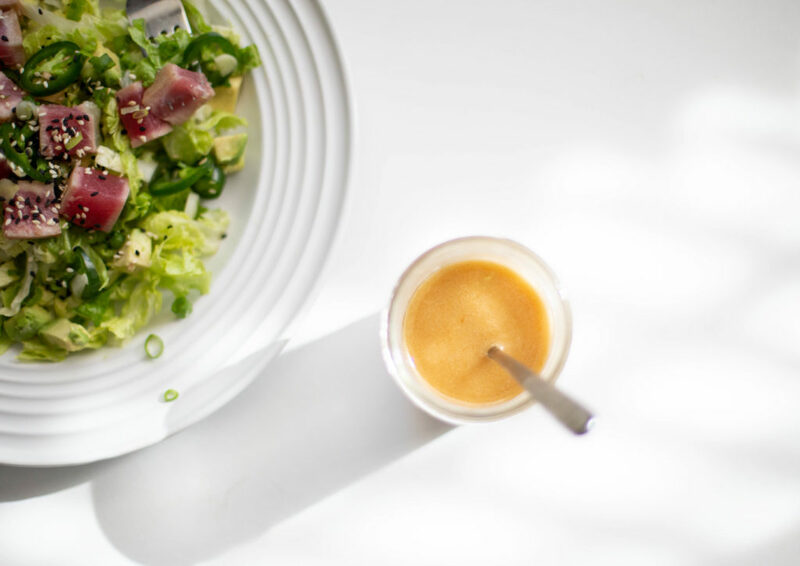 Dressing can be made ahead and refrigerated. Shake it up again as it will separate when stored. Lightly salt the tuna on all sides and let it sit for 15 minutes. Heat a skillet on high heat and coat the bottom with oil. Heat the oil until the surface of it looks like it’s shimmering. Put the tuna in the skillet. The skillet should sizzle loudly and the bottom of the tuna should immediately change colour from pink to white. Turn down the heat to medium-high if it’s too much. Sear for 1 minute and then flip the tuna – it should have developed a light to dark brownish crust. Cook it on the other side for about 45 seconds more. Take it off the heat and let it rest on a plate. Cut the tuna into bite-sized pieces. Put the jalapeno and garlic slices into a small bowl and sprinkle it with a pinch of salt and sugar. Toss it with your fingers to coat. Set aside. To assemble the salad, place however much of the shredded lettuce you’ll be eating in a bowl. Drizzle some of the salad dressing over it. Using your hands, toss it all together. Taste and add more if you’d like now or at the end. 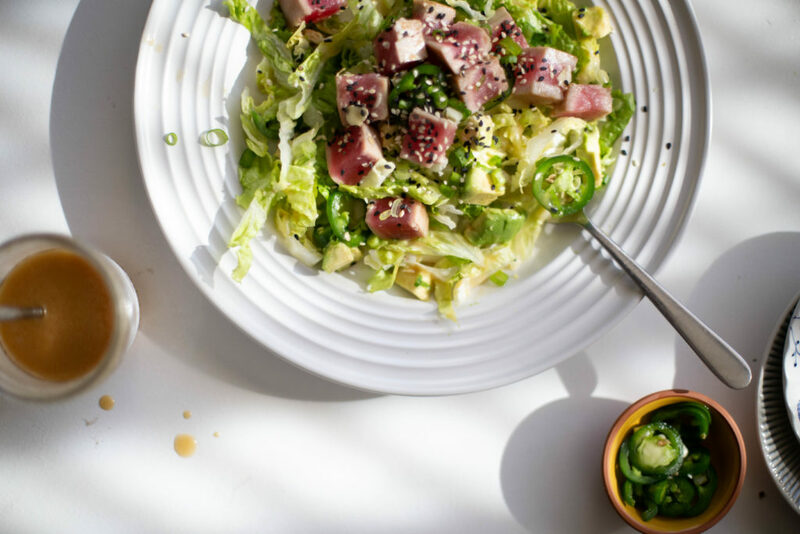 Top with green onions, avocado, jalapeno and tuna. Sprinkle sesame seeds on top and enjoy cold or at room temperature.